Analysis: Sure, Democrats want Bill Nelson to win. They'd also like to see their 2020 nominee claim a victory in the Sunshine State. 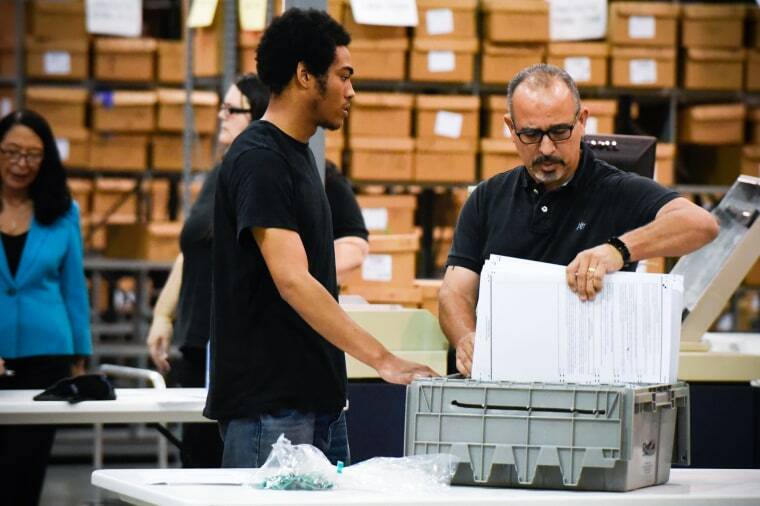 FORT LAUDERDALE, Fla. — The Florida recount isn't really about who will be the next senator from the Sunshine State — or at least, it isn't only about that. It's about the 2020 presidential election. The small armies of Democratic and Republican lawyers, oodles of operatives and platoons of protesters who have descended on Florida all know that Republican Rick Scott, who led by more than 12,000 votes after the first and second rounds of balloting, will, in all likelihood, be the winner after a hand recount is complete. Even if Democratic Sen. Bill Nelson were to pull off a miracle comeback in the final round of tallies, the Senate seat hardly justifies the attention and expense the two parties have lavished on the fight. And whatever the outcome, Republicans will retain a narrow majority in the Senate that falls far short of the 60 votes needed to prevent Democrats from stopping their legislative agenda. What Floridians are watching isn't an all-out battle over a single Senate seat — or even a fight over that prize combined with a governor's race that Republican Ron DeSantis leads by a wide enough margin that it doesn't merit a manual recount under state law. Instead, they're seeing a dry run of what could be an epic legal, political and public relations war for Florida's electoral votes in the next presidential election if the state's voters continue to be almost evenly split between Republicans and Democrats. Florida has sided with the winner of the presidential election in each of the last six contests, but they've all been close. It's been 30 years since a presidential candidate won more than 52.1 percent of Florida's vote, and the statewide winner in five of the last seven presidential elections totaled less than 50 percent of the vote. And, of course, the 537 votes that separated George W. Bush and Al Gore after a recount fight in 2000 put Bush in the White House and Gore on the speaking circuit. Since the polls closed on Nov. 6, Democratic lawyers have filed a series of lawsuits in federal and state courts challenging the actions of state officials and various aspects of election law, from the setting of deadlines for counting votes to how ballots are tallied. "They want 2020 to be the Wild West in Florida," said Brad Todd, a senior adviser to Scott. "Bill Nelson’s lawyers have known from the beginning that nothing they could do was going to reverse this election but they took the opportunity to file as many lawsuits as they could to get rid of the fraud protection laws that they dislike." But it's not just what Democrats are doing in Florida that helps put the Florida brawl in context. It's what Republicans are doing there. The GOP tapped one of its top election lawyers, Jessica Furst Johnson, to manage a team of attorneys from white-shoe Washington law firms to counter the Democratic moves here. Volunteers were quickly recruited — and offered free flights, room and board — to descend on the state in defense of Scott. And party luminaries ranging all the way up to President Donald Trump have kept up a steady drumbeat of allegations that Democrats are trying to perpetrate a fraud on the voters of Florida — to steal an election. "When people get in line that have absolutely no right to vote and they go around in circles," Trump said in an interview with the Daily Caller. "Sometimes they go to their car, put on a different hat, put on a different shirt, come in and vote again. ... It’s really a disgrace what’s going on.” He did not cite evidence to back up his assertions. Trump would have won the 2016 election without Florida's 29 electoral votes — he carried the state by a little more than 1 percentage point — but not by much. He knows it is a key piece of his electoral college coalition, and losing it would make a Democratic nominee's path to the presidency far easier. That's why the hand-to-hand combat, which is being waged in courtrooms and election supervisors' offices across the state, has much more meaning for the next presidential election than it does for the fate of Trump's agenda or his nominees in the next Congress. Jessica Levinson, who teaches election law at Loyola Law School in Los Angeles, said the battle in Florida can be about two things at once. "Like almost everything else concerning the 2018 midterms, the Florida recount is both about this year’s big races and 2020," she wrote in a text exchange with NBC. "The Florida recount feels like a stress test on the fault lines which are our voting laws. At some point they could break, and they have yet to be retrofitted."